Beets Day 1 | NJNA is Blogging! I love root vegetables! Today was the start of a two day class for Jennifer Reifenberg’s Beets. This is the third in a series of three root vegetable pieces – carrots, radishes and now, beets! I have stitched Redishes already. Jennifer is a very organized and patient teacher. We started with the band that goes between the beets which represents the earth, it will continue in what looks like layers to well below the end of the roots. 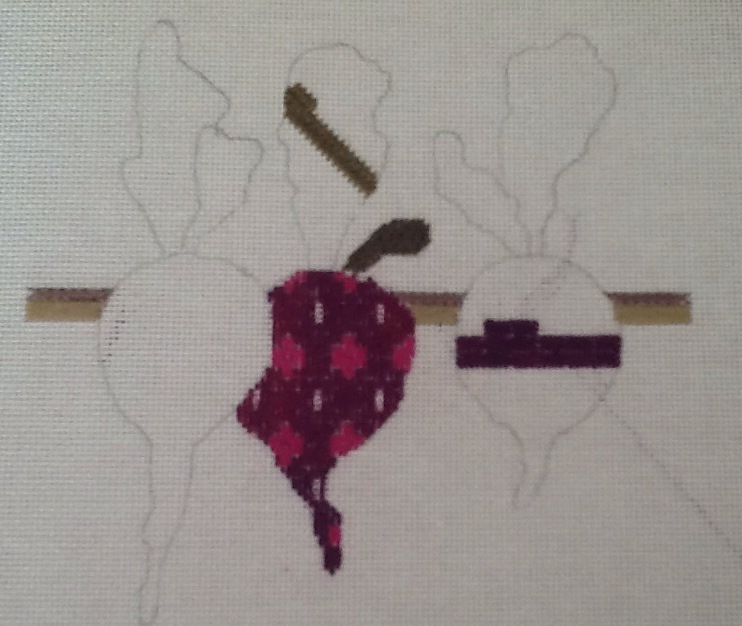 We worked on the middle and right side beets – my middle is finished except for beads. Then we tried the stitches for the leaves. But I wanted to wait to finish the leaves until I have stitched the sky behind them. Tonight we are off to Muriel’s on Jackson Square in the French Quarter for dinner. Who knows if we can sneak in some beignets?